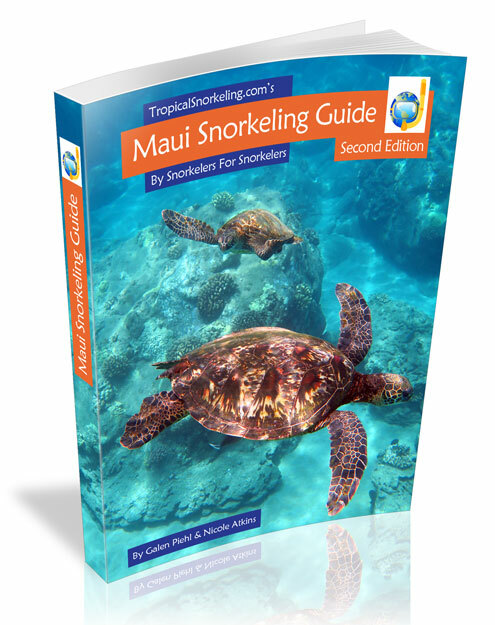 The Maui Snorkeling Guide eBook comes from an extensive amount of in the water research snorkeling one of our favorite destinations. I had travelled from New Zealand to Oahu for work, I took 3 days after for Maui wanting to get in some good snorkelling. I wasted the first day with internet suggestions. Came across this amazing guide and had the best 2 days possible. The tips on parking and entry were perfect. Winds and tide made it easy for me to plan my mornings and then find the right spots for the afternoons... lost count of the number of turtles. Highly recommend this guide... I travel for a living. ...we think your ebook is awesome! 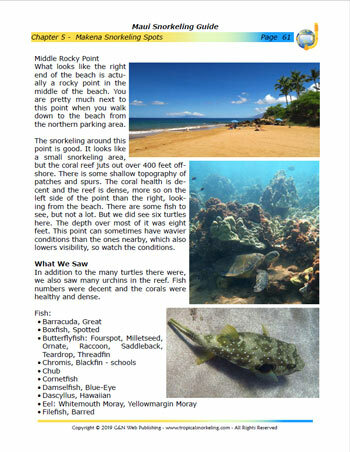 We have been frustrated by the lack of accurate information regarding snorkeling sites here on Maui. We would visit sites and find that we turn the wrong direction or not swim out far enough and miss seeing the best parts of that reef. We have used your guide and have snorkeled some amazing sites. 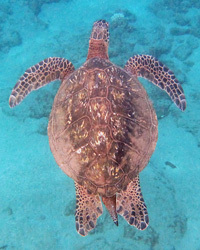 Yesterday, we snorkeled alone with large schools of fish, a 2-foot pufferfish and about 15 turtles... I was skeptical that we would need your guide and kept relying on internet sites to blindly plan our mornings. Now, we just pull up the ebook, read up on the region we are planning to visit, check the surf reports and launch wonderful dives. 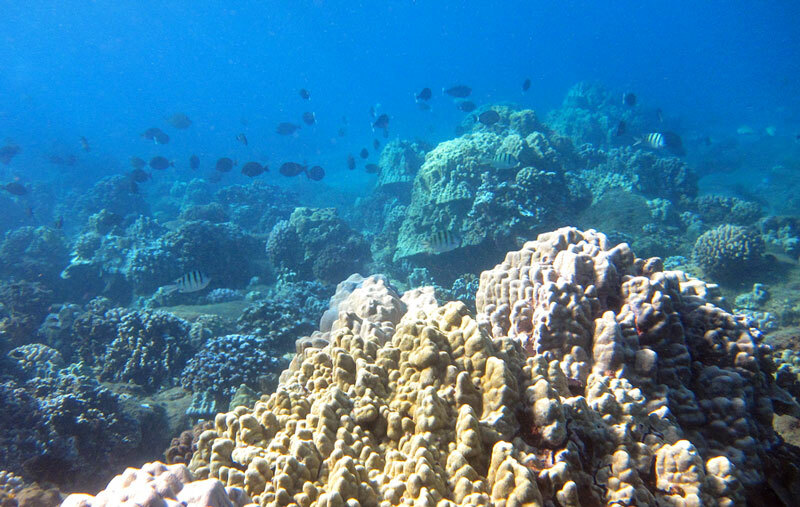 Find healthy reefs where there are lots of fish, like above. 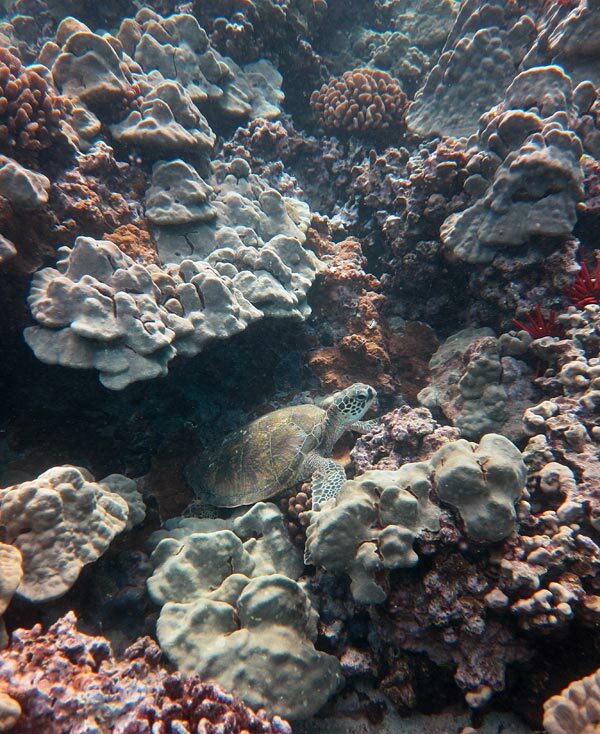 Discover turtles tucked in for a rest on a coral wall like below. 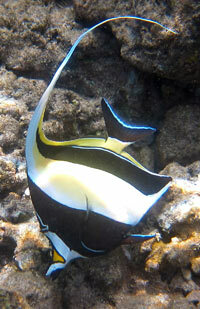 See colorful tropical fish like this Orangebar Surgeonfish, Threadfin Butterflyfish, Humuhumunukunukuapua'a, and Moorish Idol. I wish I'd had this guide ten years ago. 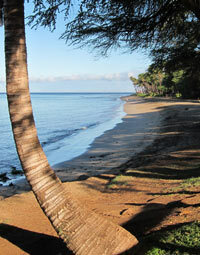 My wife and I have made five Maui trips in the past ten years and have explored and learned something new each year. Each time we learned stuff the hard way.... and slowly. This guide allows you to skip the "school of hard knocks" and helps you to optimize your time on the island. 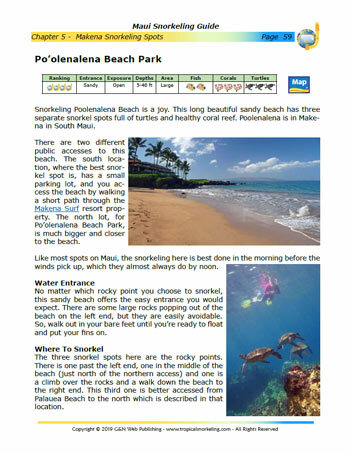 The guide identifies all the best snorkeling spots and evaluates them so that you can choose which area to invest your time into.... and then provides directions, tells you what to avoid, and where the snorkeling is located within that location. For instance, Napili Bay is huge and I've never found anything under the water there other than sand.... now I know where to explore... and plan to this coming June. In short, this guide will greatly enhance your enjoyment of the trip and is a must have for first time visitor and return visitor alike. 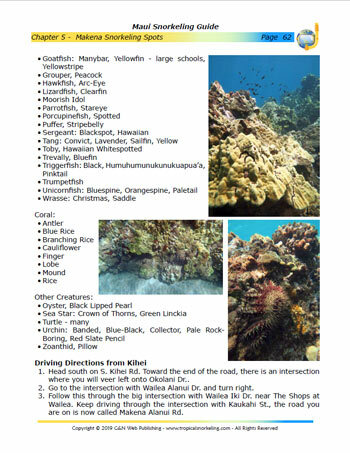 What's In The Maui Snorkeling Book? Maui is a popular destination, and some of the better known snorkel spots are very unhealthy with dead reefs because of all that traffic. And even at the better of these, if you don't know where to swim, you can easily miss finding the best stuff. To find the most enjoyable snorkeling, you will want to explore the lesser known locations we share. We focus 100% on getting you to the best snorkel sites and go overboard with useful descriptions and pictures of what it is like and how to get there. Compare this to general travel guides that are not written by snorkelers and only give a few sentences about each location. 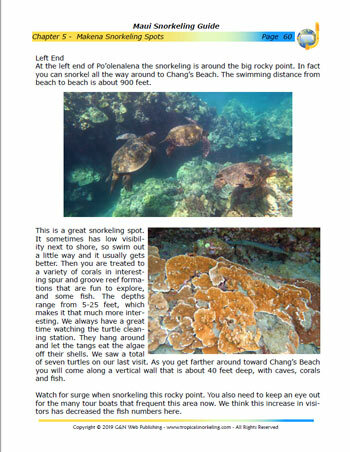 When things change we update the book, like when information came out of waste water emissions in the area of a snorkel spot on Maui, or when we find errors or bad links. Printed guides are not updated until they sell all the printed copies. 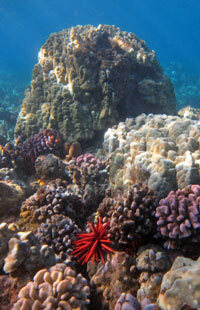 The vast majority of the best snorkeling spots on Maui are accessible from shore. That means you don't have to go on crowded boat tours on their schedule, to spots you can't control, no matter the weather. Your snorkeling will be better and you will save money in the process. Where boat tours are a good idea, like to Molokini, we recommend them. 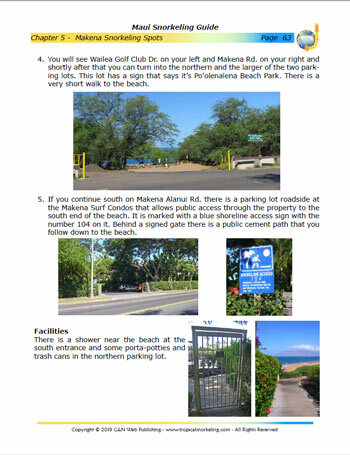 The best part, besides the obvious descriptions of the locations, are the photos describing access and parking at the site. It really helps the non-local orient themselves and ensure they are at the right spot.